"It must be done right"
No. 16 What's to be Done? 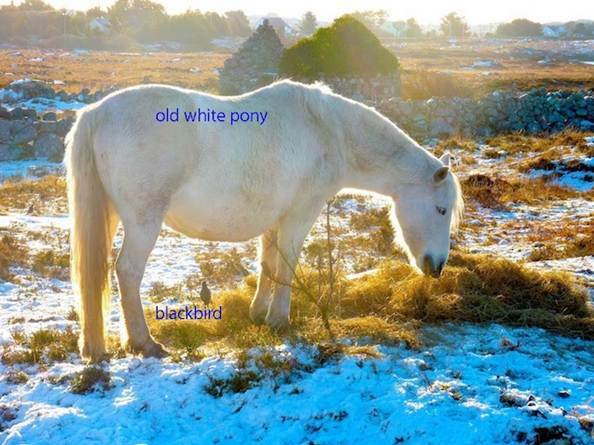 A blackbird encountered a pony in winter. The bird's tribe had flown south. The pony was past his prime. They were both cold and hungry. The pony shared his straw. Birds do not eat straw. The blackbird shared a berry. Ponies avoid strange berries. They stayed together. The blackbird whistled the night away. The pony whinnied a welcome to the morning. The winter passed. In Spring the blackbird was captured by an eagle. The pony was brought to a factory which made fertiliser. No life is pointless, no death is useless. are now available on two DVDs in pristine 16:9 format. "...some form of gnarled, self-conscious, confrontational howl." Book & film quartet of films. 'Kill your Darlings' , a newish novel by Bob Quinn, is now available at Kindle Store. On the 50th anniversary of the setting up of RTE its time to read "Maverick"again.